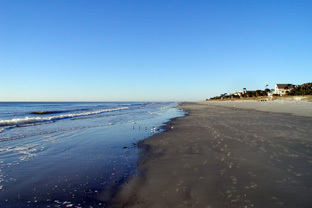 Forest Beach is one of Hilton Head Island’s original beach communities. Located between The Sea Pines Resort and Shipyard, it has its own charm. This charm comes from a community for which change comes gradually. Because of its beautiful beaches, Forest Beach was one of the very first areas to be built in the early 1960’s. These first homes became the model for early Hilton Head design. The architecture of these cozy beach homes created a wonderful close-knit community atmosphere which continues today. As some of the homes were renovated, a new crop of properties have been built in Forest Beach. These newer homes have become some of Hilton Head Island’s highest income producing rental homes. Most properties in Forest Beach are walking distance or a short bike ride from Coligny Plaza which offers shopping, restaurants, movies and free seasonal entertainment. There’s also a water park and a miniature golf course available.